We check over 450 stores daily and we last saw this product for $16 at BaubleBar. 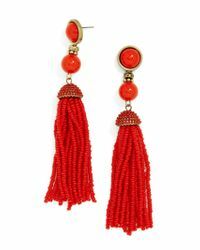 Bold beaded tassel earrings get dressed up with cabochon-embellished posts. 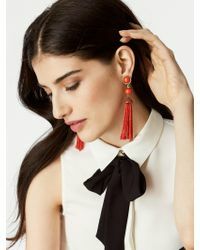 These look especially on-trend when styled with soft hues and softer fabrics. Copyright © 2016 BaubleBar, Inc. Zinc casting, glass seed bead, acrylic stones, surgical steel posts. Gold ox plating. Post back. Length: 4.45"; width: 0.6", substantial weight: 0.54 oz.